I just got a freelance assignment that marked my return to print journalism after a decade. The post is about how much fun it was to be a reporter again for a week or two. I finally open up about how it feels to be hated by a celebrity. I linked two posts this week not because I'm so super awesome that I couldn't just choose one, but because one post is a review of a book I think many of my fellow writers will find quite inspiring and the other post is my response to a writing exercise that I think you all will enjoy tackling. 8. Birmingham Blogging Academy - Alabama Bloggers' own Rachel wrote a second even more awesome guest post, this one on hacks to get your Pinterest stats. Read it! 9. Wade on Birmingham - A look at Social Media Day 2012 in Birmingham, with a fun tweetup at the J. Clyde. Nuts. The above comment wasn't supposed to be anonymous, but from yours truly. 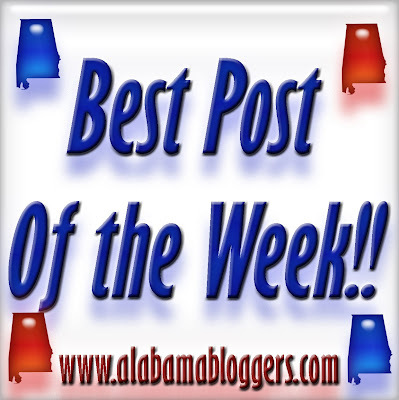 I'm glad I found a site dedicated to bloggers in Alabama! I'm Jason Coleman of BevNerd.com. My site is all about beverages, snack food, festivals, travels and anything relevant. Justin Smith and I record video reviews of soft drinks, snack foods, craft beer and travel vlogs. We look forward to meeting fellow Alabama Bloggers! I've been doing Cooking in the Car posts for about three years now. My link is the first one of 2012.